Family Tree DNA made two announcements today. The first shares the news that the Y-DNA12 test will be permanently offered at $49. The current $39 sale will end on March 31st, so if you want more of these tests order them now. The basic mtDNA test will soon undergo a similar reduction. Family Tree DNA will also be adding new customer service and IT staff to keep up with the growing demand. This is all great news for the genetic genealogy community. The second was a press release detailing the exciting scientific discovery that was made through a customer from the FTDNA database thanks to the astute project administrator Bonnie Schrack. I wrote about the genealogical implications of this discovery earlier this month here. It is with great satisfaction that we announce a permanent price change and other improvements that will positively impact your projects. Due to the recent upgrade of our state-of-the-art laboratory, coupled with research and development into increasing lab efficiency, we are able to permanently offer the basic Y-DNA12 test for $49 beginning April 1, 2013. The current sale of Y12 at $39 will end at 11:59PM CST, March 31, 2013. We are also working on bringing down the price of the basic mtDNA test as well; we hope to have that accomplished during the first half of this year. We understand that several projects have a minimum requirement of 37 markers for the Y-DNA test, but we’ve learned through the promotion with the lower price point on the Y-DNA12 last month, that it did not reduce the number of orders at the 37-marker level. Therefore, there was a net gain for the database, not only by increasing the number of members, but also increasing the number of potential upgrades to higher levels. We hope that you can encourage family and friends who saw the price as a barrier to now come on board. It is our goal to ensure every single person is able to have the "DNA experience," at least at the basic level. We are working on a letter that you can send to family and friends to invite them to take advantage of the new pricing. Family Tree DNA is the only company exclusively dedicated to genetic genealogy and anthropology. We offer the widest range of tests, from the basic ones mentioned above to specific SNPs and all to way to the "Walk Through the Y" and the Full Mitochondrial Sequence. Every month our lab in Houston processes tens of thousands of discrete tests. Given the increase in the volume of orders and tests, we are adding additional people in our Customer Service department. These are all qualified personnel that receive very specific training and who give an individual answer to each email and phone call that they receive under almost every circumstance. Our policy has always been to answer email between 24 to 48 hours (excluding on weekends), and we are working towards coming back to this norm. We apologize for the inconvenience that delays beyond this norm have caused and we appreciate your patience and support while this situation is being corrected. Making sure that our Laboratory Information Management System (LIMS) works flawlessly so that there are no mix-ups in the lab or errors during processing. Making sure that results coming out of the lab are seamlessly integrated with the personal records from our customers. Writing the code for new features to be implemented, whether those features are conceived in-house or at the suggestion of our customers. Obviously, they also have to fix bugs, because as we know - unfortunately - bugs happen. Any of you that have iPhones, iPads or Android apps know that we receive almost daily notifications for updates which most of the time relate to bug fixes. That doesn’t mean we accept all bugs as inevitable—beyond a certain point they’re not acceptable, so we are also taking the necessary steps to improve this situation by hiring additional qualified people. We believe that the results will be noticed soon. Again, we apologize and appreciate your patience and support. As we grow and remain the leading company in the field of genetic genealogy and anthropology, we want to recognize the vital contribution that you - the project administrators - have played in this field since we pioneered it in 2000. The recent groundbreaking paper "An African American Paternal Lineage Adds an Extremely Ancient Root to the Human Y Chromosome Phylogenetic Tree," published in the most prestigious journal in the field, The American Journal of Human Genetics, and widely mentioned in the press, was generated from a sample analyzed at our lab. The paper was authored by a group that included Family Tree DNA group administrators, our lab people and a member of our Scientific Advisory Board among others. This is a testament not just to the quality of FTDNA's science, but also to your contribution as citizen scientists over the years. For that we sincerely THANK YOU! Houston/March 26, 2013 /PRNewswire/ -- Gene By Gene, Ltd., the Houston-based genomics and genetics testing company, announced that a unique DNA sample submitted via National Geographic's Genographic Project to its genetic genealogy subsidiary, Family Tree DNA, led to the discovery that the most recent common ancestor for the Y chromosome lineage tree is potentially as old as 338,000 years. This new information indicates that the last common ancestor of all modern Y chromosomes is 70 percent older than previously thought. The surprising findings were published in the report "An African American Paternal Lineage Adds an Extremely Ancient Root to the Human Y Chromosome Phylogenetic Tree" in The American Journal of Human Genetics earlier this month. The study was conducted by a team of top research scientists, including lead scientist Dr. Michael F. Hammer of the University of Arizona, who currently serves on Gene By Gene's advisory board, and two of the company's staff scientists, Drs.Thomas and Astrid-Maria Krahn. The DNA sample had originally been submitted to National Geographic's Genographic Project, the world's largest "citizen science" genetic research effort with more than 500,000 public participants to date, and was later transferred to Family Tree DNA's database for genealogical research. 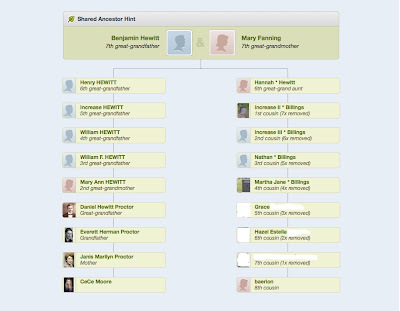 Once in Family Tree DNA's database, long-time project administrator Bonnie Schrack noticed that the sample was very unique and advocated for further testing to be done. "This whole discovery began, really, with a citizen scientist – someone very similar to our many customers who are interested in learning more about their family roots using one of our genealogy products," said Gene By Gene President Bennett Greenspan. "While reviewing samples in our database, she recognized that this specific sample was unique and brought it to the attention of our scientists to do further testing. The results were astounding and show the value of individuals undergoing DNA testing so that we can continue to grow our databases and discover additional critical information about human origins and evolution." The discovery took place at Family Tree DNA's Genomic Research Center, a CLIA registered lab in Houston which has processed more than 5 million discrete DNA tests from more than 700,000 individuals and organizations, including participants in the Genographic Project. Drs. Thomas and Astrid-Maria Krahn of Family Tree DNA conducted the company's Walk-Through-Y test on the sample and during the scoring process, quickly realized the unique nature of the sample, given the vast number of mutations. Following their initial findings, Dr. Hammer and others joined to conduct a formal study, sequencing ~240 kb of the chromosome sample to identify private, derived mutations on this lineage, which has been named A00. "Our findings indicate that the last common Y chromosome ancestor may have lived long before the first anatomically modern humans appeared in Africa about 195,000 years ago," said Dr. Michael Hammer. "Furthermore, the sample, which came from an African American man living in South Carolina, matched Y chromosome DNA of males from a very small area in western Cameroon, indicating that the lineage is extremely rare in Africa today, and its presence in the US is likely due to the Atlantic slave trade. This is a huge discovery for our field and shows the critical role direct-to-consumer DNA testing companies can play in science; this might not have been known otherwise." About Gene By Gene, Ltd. Founded in 2000, Gene By Gene, Ltd. provides reliable DNA testing to a wide range of consumer and institutional customers through its four divisions focusing on ancestry, health, research and paternity. Gene By Gene provides DNA tests through its Family Tree DNA division, which pioneered the concept of direct-to-consumer testing in the field of genetic genealogy more than a decade ago. Gene by Gene is CLIA registered and through its clinical-health division DNA Traits offers regulated diagnostic tests. DNA DTC is the Research Use Only (RUO) division serving both direct-to-consumer and institutional clients worldwide. Gene By Gene offers AABB certified relationship tests through its paternity testing division, DNA Findings. The privately held company is headquartered in Houston, which is also home to its state-of-the-art Genomics Research Center. 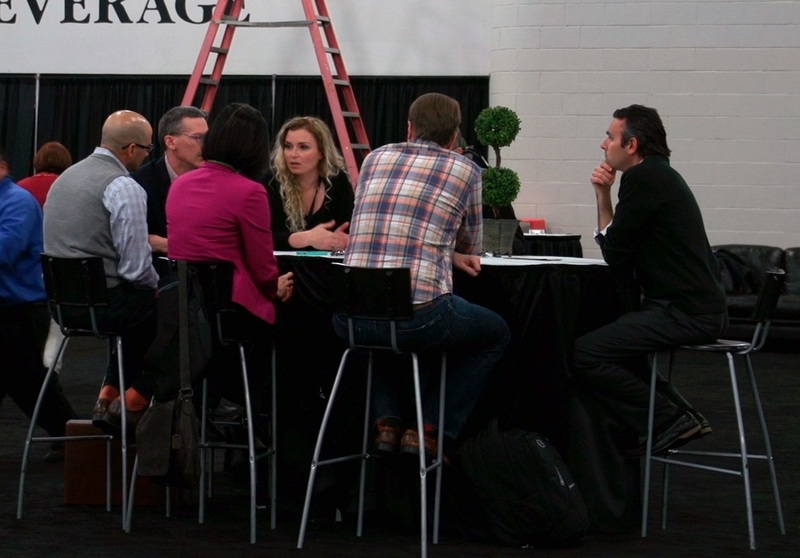 On Thursday, AncestryDNA fulfilled their promise to allow customers to download their raw data. As Dr. Ken Chahine had assured me back in November, the file is not encrypted and is compatible with third party tools. After working with it a bit, John Olson announced on the site that he expects that Gedmatch will be accepting AncestryDNA uploads in about two weeks. David Pike told me that he has updated his tools to work with the AncestryDNA files. Leon Kull has reportedly updated his HIR search site to work with them as well. Dr. Ann Turner has created an Excel macro to convert the AncestryDNA files to 23andMe format. Bennett Greenspan told the audience that Family Tree DNA will be accepting AncestryDNA transfers into Family Finder starting on May 1st. Dr. Catherine Ball confirmed that the raw data file is not phased and that they are delivering it as they receive it from the chip manufacturer Illumina. She also confirmed what Dr. Ann Turner had already discovered - the data labeled as "Chromosome 25" is from the PAR region. Further, the "Chromosome 23" label refers to the X chromosome data and "Chromosome 24" refers to the Y chromosome. Unlike Family Tree DNA, AncestryDNA is not removing any SNPs from the data - medically relevant or not. The overlap between AncestryDNA's raw data file and 23andMe's should be around 690,000 SNPs due to the fact that they are both using the same Illumina OmniExpress Plus base chip. The ~10,000 SNP difference can be accounted for due to a different set of poorly preforming probes and test SNPs. Family Tree DNA's should have a similar overlap for the same reasons. There is no mitochondrial DNA included in the raw data file because it is not included on the Illumina chip that they are using. (23andMe adds the mtDNA SNPs). 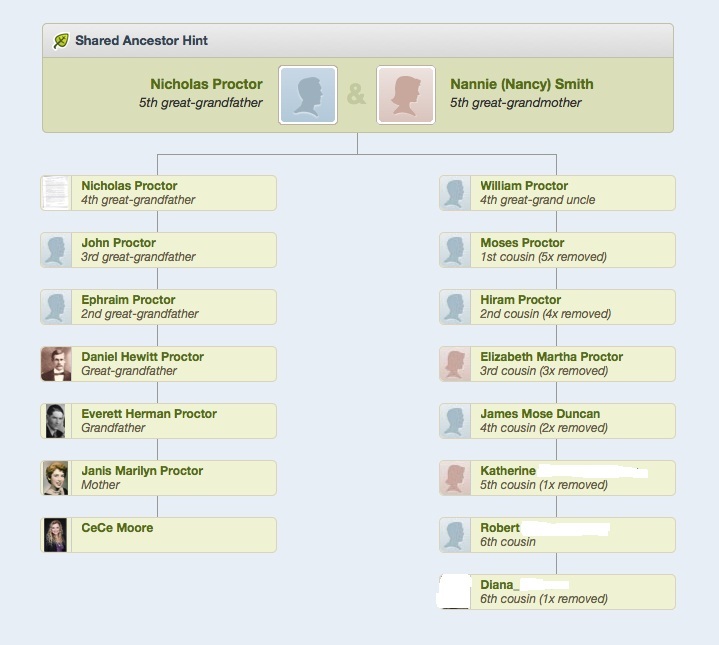 As I expected from earlier conversations with AncestryDNA, a search function is next on the list. Kenny Freestone, Product Manager for AncestryDNA, discussed it in his presentation under the heading "What's Next". Although it is already in the works, Kenny could not provide a firm timeline for its availability when I asked. We will be able to filter our list of matches by surname, location and username. 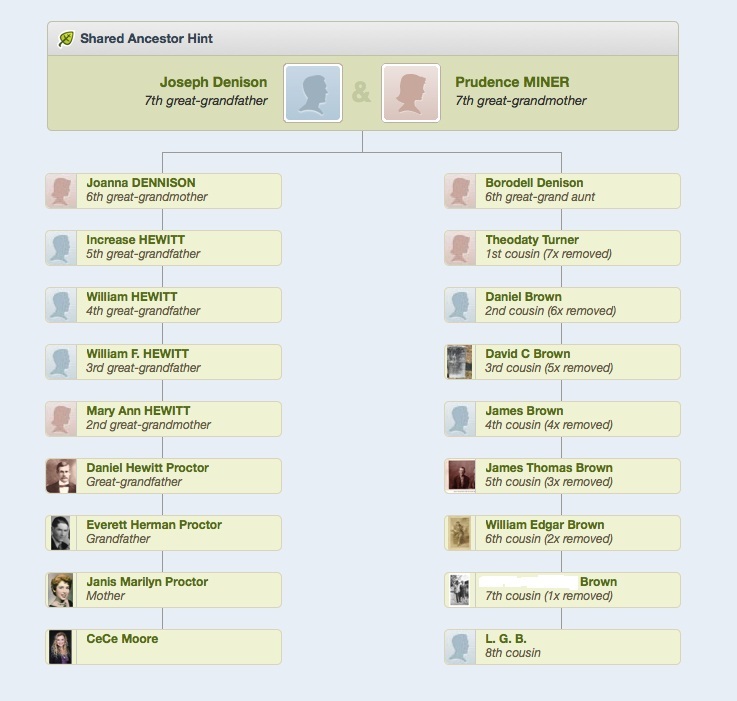 As anyone who has worked with their AncestryDNA matches knows, this is sorely needed. There is no doubt that the many requests from customers pushed this up their list of priorities. Later this year, AncestryDNA will be updating their Genetic Ethnicity feature. They will provide more granularity in Europe and West Africa. We can also expect more accurate breakdowns. A number of AncestryDNA personnel acknowledged to me over the weekend that certain "ethnicities" (i.e. - Scandinavian) are overestimated for many customers. However, they also emphasized that much of the perceived problem with their admixture analysis stems from the question of "where and when". What they mean by this is that it is very difficult (and sometimes impossible) to pinpoint where specific DNA signatures were at an exact time in history. As I always remind my readers, this portion of the science has a long way to go and will improve with more data and time. 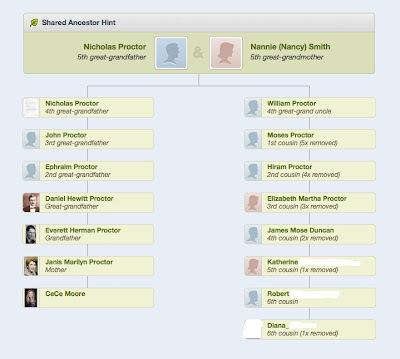 On the "more data" front, during her speech at the AncestryDNA luncheon on Friday, Dr. Ball was reportedly requesting that genealogists who know that all eight of their great grandparents were born in the same place share this information with AncestryDNA. This seems to imply that, like 23andMe has successfully done, AncestryDNA plans to use customer data to improve their predictions. They are also starting to work on incorporating the coveted SMGF collection into their admixture analysis, which should improve it greatly. 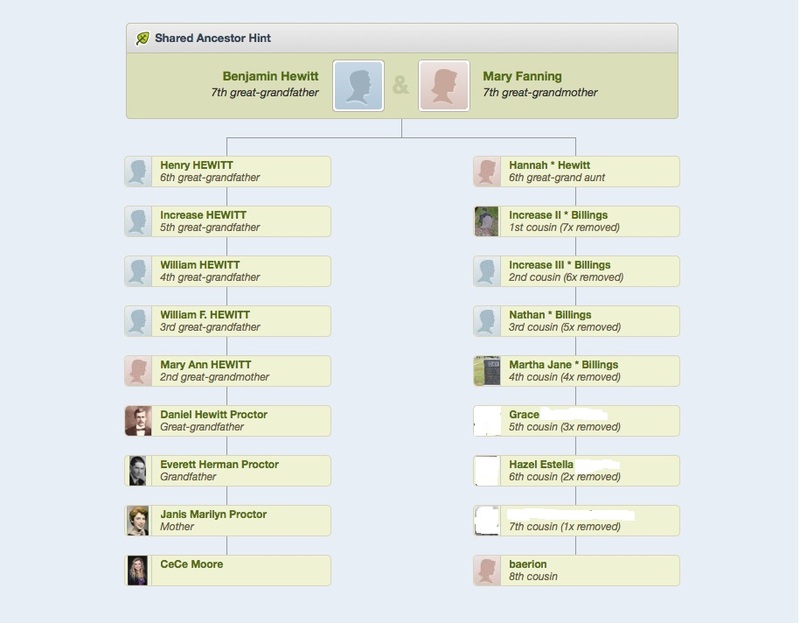 The good news is that AncestryDNA customers don't have to wait for this update to gain more insight into their ancestral origins. Now that AncestryDNA has made the raw data available, customers will be able to upload their raw data file to the various third party sites to try out the admixture calculators and/or send it to Dr. McDonald for his very highly regarded analysis. AncestryDNA are currently working on an algorithm to improve matching for endogamous populations, specifically Ashkenazi Jews. As I reported in November, the minimum threshold for matching is 5 megabase pairs. This was reconfirmed in a conversation I had with Dr. Ball on Friday. I also learned that there is no minimum SNP requirement. We discussed the possibility of AncestryDNA switching to centiMorgan measurements in the future. The test is now $99 for everyone - subscribers and non-subscribers. This was likely in response to 23andMe's recent price drop. Having attracted well over 120,000 customers in less than a year in business, AncestryDNA is proving to be an important player in this field. This new policy to attract subscribers and non-subscribers alike will only improve their market share. It does not appear that AncestryDNA has plans to offer their test to international customers in the near future, instead choosing to focus on the U.S. market for now. 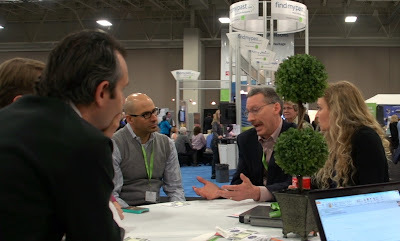 On Friday at RootsTech, Dr. Tim Janzen and I sat down for a meeting with AncestryDNA management. Among others, we were joined by Dr. Ken Chahine, Senior Vice President and General Manager of DNA, and Dr. Catherine Ball, Vice President of Genomics and BioInformatics. (Dave Dowell also attended a portion of the meeting.) 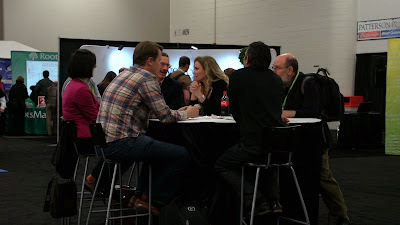 I found them to be very receptive to hearing our requests and the reasons behind them. At no time did they state that they had decided not to build a chromosome browser or release matching segment data to their customers in the future. Dr. Ball did express some privacy concerns, but was open to hearing ideas of how this could be addressed. On Saturday, after attending Kenny Freestone's presentation, four advanced genetic genealogists approached him to discuss the chromosome browser issue. In addition to myself, Tim Janzen, Angie Bush, and Nathan Machula were present for the conversation. Kenny didn't have much to say and mostly listened to the arguments that we presented covering why we feel that it is essential that AncestryDNA offer the matching segment data behind their relative predictions. At no time did he state that AncestryDNA would not offer a chromosome browser or that the delay in doing so was because AncestryDNA didn't think that their customers could understand it. He did, however, confirm that it was not a top priority at this time. He also said that he personally reads all of the requests sent through the feedback button, so if you want them to reassess their priorities, then be sure and let them know. On my AncestryDNA account, I was happy to find a shaky leaf hint a few weeks ago. Upon reviewing the match, I noted that the common ancestor was through my mother's side. 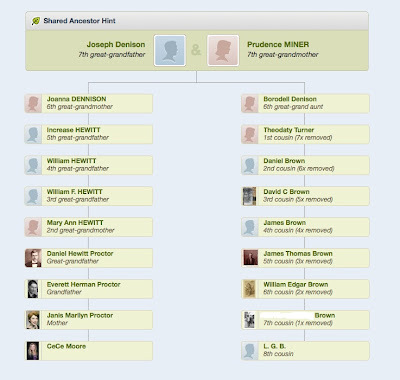 I was initially excited to see that I had inherited DNA from my 7th great grandparents on paper, Joseph Denison and Prudence Miner. The only problem is that this match doesn't appear anywhere on my mother's 47 pages of matches. Do you know what this means? It means that I must have inherited the DNA responsible for the match through my father's side. Since all DNA inherited through my mother's line must come through her, AncestryDNA has identified the wrong common ancestor as the source of the DNA shared between LGB and me. A fluke of the algorithms...? Perhaps. Let's look at some more of my matches. Once again, as you can see, the common ancestor identified by AncestryDNA is on my mother's side. A thorough search of my mother's matches shows that, once again, this person is not reported as a match to my mother. From this, we can only reach the conclusion that the DNA responsible for this match comes through my father's side - not my mother's. The common ancestor that I share with "Baerion" must be beyond a brick wall in her family tree or on my paternal side. In general, I have had more success filling in the branches of the maternal side of my family tree than the paternal side, so this is certainly possible. This match doesn't appear on my mother's match list either! So, out of my ten matches that have shaky leaves attached, three of them apparently have common ancestors wrongly identified as the source of our matching DNA. Do you see the problem here? Does AncestryDNA? If this match were, instead, at 23andMe or Family Tree DNA, I could check the DNA segment that we share and compare it to my other matches and/or my chromosome map. This would provide additional information and/or evidence to help me determine through which of my ancestral lines this segment of DNA was inherited. Might there be other explanations for these discrepancies? It is certainly possible, but without the underlying genetic data, it is impossible to say. I am in the fortunate position to have tested my mother at AncestryDNA in addition to myself, so I can clearly see there is an issue. What about all of those people who have not tested a parent and are blindly accepting AncestryDNA's shared ancestor hints because they don't know otherwise? Isn't that kind of like copying someone's tree and just taking their word for it that it is correct with no sources or evidence attached? For now, those of us who do understand the finer points of autosomal DNA matching will have to do our best to convince our matches to upload to Gedmatch so they can see for themselves what they are missing. As much as I, too, am disappointed that AncestryDNA has not yet provided the matching segment data, it is clear to me that the reasons behind this decision are far more complex than what others may claim is an attempt to dumb down the product because Ancestry.com thinks its customers are stupid. From my many conversations with Ken Chahine and others from AncestryDNA over the past year, I have come to appreciate that working within the framework of this 1.6 billion dollar corporation comes with its own set of challenges. Tim Sullivan, CEO, has made it clear that Ancestry.com is committed to the DNA business and Ken Chahine has always been upfront with me and come through with his promises. So, I am going to give them the benefit of the doubt. From our very first conversation, I have advocated for the genetic genealogy community and looked out for our best interests and I won't stop doing so. I believe that they will do the right thing for their customers and the genetic genealogy community eventually. It may not happen as quickly as we would all like (yesterday! ), but they are not the big bad wolf and I think it does us all a disservice to continually paint their intentions in a negative light. We are in early days yet. Let's give them a break. The academic paper describing the discovery of a new root of the human Y chromosome tree, An African American Paternal Lineage Adds an Extremely Ancient Root to the Human Y Chromosome Phylogenetic Tree, was finally released. This is important news for the entire scientific community, however it is possibly even more significant for our community of citizen scientists. Well-known genetic genealogist Bonnie Schrack is listed among the authors of this groundbreaking paper, which was published in the American Journal of Human Genetics on Thursday. She is the administrator of the Y-Haplogroup A Project at Family Tree DNA and was the one who first came upon the very unusual results from a project participant that ignited this entire discovery. At the Family Tree DNA Conference last November, we were treated to a sneak peek into this history-changing research. I chose not to cover it at that time out of deference to the academics' plans to publish. However, I am now free to discuss the presentation and the findings. I'm sure many blogs will cover the more technical aspects of this important paper and the A00 Haplogroup, but I would like to focus on what this discovery means for us as genealogists and citizen scientists. At the FTDNA conference, Bonnie Schrack described how several of her project participants just didn't seem to fit into any of the known haplogroup subclades. She brought this to the attention of FTDNA's Dr. Thomas and Astrid Krahn who, after much investigation and several Walk Through the Y tests on these divergent Y chromosomes, alerted Dr. Michael Hammer to one especially unique Y-chromosome. And the rest, as they say, is history. One of the many very exciting aspects of this discovery for genealogists is that the scientists were able to compare the values of six of the Y-STRs commonly tested for genealogical DNA tests from "Mr. A00 Perry's" results to a database at an academic institution to determine that this haplotype is similar to 11 samples from Mbo individuals, a Bantu speaking population from western Cameroon. We then genotyped a set of six Y chromosome short tandem repeats (Y-STRs) (DYS19, DYS388, DYS390, DYS391, DYS392, and DYS393) and found that the A00 chromosome carried the following alleles: 16-11-19-10-12-13. Upon searching a large pan-African database consisting of 5,648 samples from ten countries (Cameroon, Nigeria, Ghana, Senegal, Uganda, Tanzania, Malawi, Zimbabwe, Mozambique, and South Sudan), we identified 11 Y chromosomes that were invariant and identical to the A00 chromosome at five of the six Y-STRs (2 of the 11 chromosomes carried DYS19-16, whereas the others carried DYS19-15). These 11 chromosomes were all found in a sample of 174 (~6.3%) Mbo individuals from western Cameroon. Another thing I might mention is that our African American project members are a far closer match to the Bangwa people, whose haplotypes are found in the SMGF database...than to the Mbo who were sequenced. The Bangwa and Mbo are close neighbors, and rivals...when talking about who our project member's kinfolk in Africa might be, it's a far better chance they're Bangwa, from Fontem, Lebialem, than Mbo. We found two SNPs in our project members that were negative in the Mbo -- perhaps they'd be found positive if Bangwa were tested. The Y-STR markers in question are all tested as part of the first panel for Y-DNA tests at Family Tree DNA. This means that a simple 12 marker Y-DNA test (currently only $39) would show if a man potentially matches this very unique haplotype or not. One of the Haplogroup A Project's stated goals is "to provide information on ancestral origins for African-American participants". This exciting discovery does just that and shows us the potential that is out there for African Americans searching for their African roots. We also estimated the level of variation among nine A00 lineages (i.e., including one additional Mbo individual) by using a battery of 95 Y-STRs for which all individuals had no missing data. A median-joining network shows that the African American A00 lineage is 11 mutational steps from the nearest Mbo and that the maximum difference between any pair of Mbo is nine steps. On the basis of these levels of within- and between-group variation, we calculated a second divergence time estimate of 508–2,428 years. It has been determined that the Y chromosomes most similar to his are currently found in the Southwest Region of Cameroon on the West Coast of Africa. This fits well with their known family history of descent from Albert Perry, a slave, and the transatlantic slave trade originating from this area to the Americas. The lower end of the estimated range for the common ancestor between "Mr. A00 Perry" and the Mbo men also fits well within the time frame of the slave trade. If it is true that the Bangwa men are more closely related to him than the Mbo men, this makes for an even stronger case. These momentous discoveries were made thanks to tenacious and inquisitive citizen scientists, as well as willing participants within the framework of a commercial testing company. Not only were the noteworthy haplotypes originally recognized by genetic genealogist Bonnie Schrack, but the subsequent research was largely funded by the genetic genealogy community as well (notably Stan Pietrzak and Hamma Bachir Ahmed). Further, the private participants identified as potentially historically significant willingly underwent additional testing where necessary. Finally, the discovery of the A00 lineage demonstrates the power of public participation in the scientific process—a venture that is likely to continue in the current era of personal genomics. I think we can all bet on that! This just goes to show that we have much more to learn about our shared history. Now, get out there and test those family members! You never know what you might find...Maybe you will help to unearth the next big discovery. Citizen science has come of age!